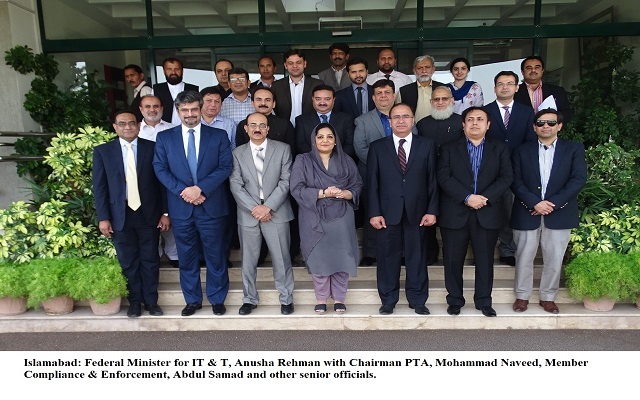 Federal Minister for IT and Telecom, Anusha Rahman Ahmad Khan visited Pakistan Telecommunication Authority (PTA) Headquarters. Member Telecom (MoIT), Mudasar Hussain, Member HRD (MoIT), Muhammad Tahir Mushtaq, Member IC (MoIT) Yasir Qadir, Chairman PTA, Mohammad Naveed, Member Compliance & Enforcement PTA, Abdul Samad, and senior officers of MoIT and PTA were present on this occasion. The Minister said that broadband sector growth has been extraordinary and this sector has become a model for other countries across the world. Several initiatives for the development of information and communication technologies (ICTs) such as ICT4Girls programme targeting thousands of school girls in Pakistan and DigiSkills programme, an important platform for creating online employment opportunities were undertaken. Chairman PTA, Mohammad Naveed expressed his gratitude for the support provided by MoIT & T, and appreciated the Minister’s valuable contribution in the promotion of advanced ICT services in Pakistan, and the achievement of critical milestones such as Spectrum Auction, rapid growth of ecommerce industry in Pakistan and increased broadband coverage across the country. Member Compliance & Enforcement PTA, Abdul Samad also thanked the Minister for her support, acknowledging that during her tenure the IT industry greatly thrived and flourished. The Minister and the officers also touched upon the opportunities and challenges that presented themselves during the last few years. On this occasion, Chairman PTA also presented a souvenir to the Minister, and later the outgoing Minister also planted a commemorative tree at PTA vicinity.